we have only a few available. It is now a collector's item. Leave it to one of the most trusted names in outdoor gear, Browning, to come up with a small and outstandingly useful small lockback folder that is a joy to see and own. Stainless bolsters and liner lend just the right touch to this graceful folder. Further, they have used the finest Japanese steel for the blade, and etched it with a classic scroll design on this outstanding lockback folder. Shown with Fossil walrus Ivory - bicolor peach. Our Browning Gentleman's or Lady's Mini-Lockback Folder measures 3 inches closed. 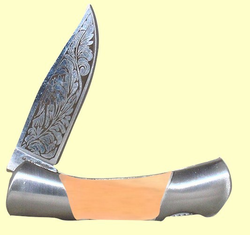 Its 2 inch drop point etched blade is made to lock firmly - very easy to use. Our Fossil Ivory scales ensure that this knife will become a sought after heirloom piece. Included is a hand etched scrimshaw design and initials, name or date. You won't find a more perfect gift! As an option, we will scrimshaw an etching of a picture of your choice, (sail or power boat, pet, family crest - as shown in photo above) - Just email or snailmail us a picture. Don't wait too long - We have only a few of these great knives! Please note: scrimshaw and personalization not available with Dark Brown Fossil Mammoth Ivory.